If you are interested in your business being taken seriously on the Web, it is crucial that your site is nothing less than professional. Do you know what the difference between a professional site and one that was created by a novice is? The amount of attention to detail. It is usually easy to spot amateur sites. They are filled with gaudy colors, home pages with too many elements and other design components that make the site look really cheap. Whether you know this or not, the font makes a really big difference. If people cannot read the content you post, it is not likely they will buy anything from you. This may seem like an obvious piece of advice, but many site owners focus on their own preferences and not those of the customers. Accessibility refers to the ability of people with disabilities and physical limitations to access your content. This is a crucial part of offering a great user experience. There are actually some governments that are creating laws pertaining to this. Accessible sites are more helpful than most people can imagine. Consider this: Most people over the age of 40 need glasses in order to see well. This means that small, cute font is not going to go over well with a lot of your audience. Font should not be illegible. This refers to the style as well as the size. Things that have too many curves and frills can be really difficult to read. If you have any doubts, you can always fall back on the Sans-Serif font. This is a basic font that does not have any flourishes that will make it illegible. You would not send a customer endless emails on one day right, so why do this when it comes to font? 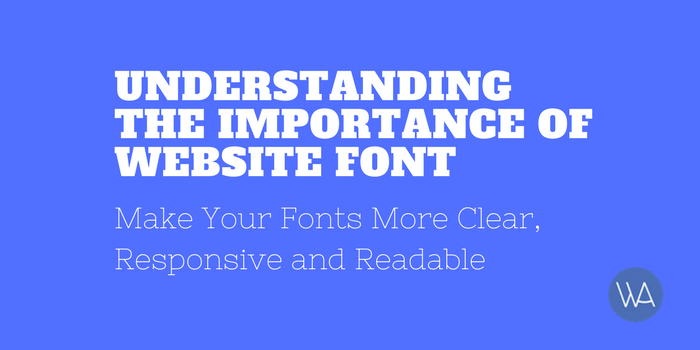 Many amateurs make the error of using far too many fonts on the same site. Ideally, you should not use more than three separate fonts when you are designing a website. It can be hard with so many free fonts available. This is actually a fairly generous number. Besides logos, you should probably use no more than two different ones. You can change them a little by adding bold, italic and color effects. This will keep things interesting. Why is it bad to use too many fonts? They will confuse people and stop the brand from appearing cohesive. They also make people pay more attention to the font than the content you are offering. Why do you want to pull attention away from the products and services you are offering? Unless you are in the business of selling fonts, be very careful with how many you use. Helvetica, Verdana, and Arial are three fonts that were popular a couple of decades ago. While many still use them, they are considered very out of date. When people created websites years ago, the font choices were not as vast as they are today. They are now many modern fonts available that are great looking and very easy to read. Today it is easy to use a decent font considering all of the options that are currently available. The “Sans” fonts are some of the best when it comes to website design. Keep in mind that being hot and trendy does not make up for using a font that is not legible on all types of platforms. If you cannot see it well from a mobile device, you should not use it. If there was no font, your text could not be displayed. This is the single most important mechanism when it comes to creating content. This is why choosing the right one is so important to the success of your site.